I just love weather like this! We've had our initial 2 weeks of mostly wet weather, and now the "rainy" season has settled down. Sure, we can expect some rainy days in the next few months, but as I have said many times - it's a great time of year to visit Phuket (see Phuket Weather in the Low Season). Yesterday we spent a few hours at the beach. Surprisingly, despite living in Phuket, we don't go to the beach that often. 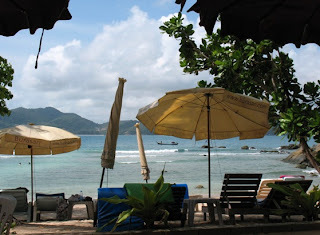 Yesterday we headed to Paradise Beach, which is near Patong, a bit further round the bay to the south. The proximity to Patong does mean it's busy in the high season, but now it's low season, this little gem is nice and quiet. We sat with friends, drank some beers, played with the kids. 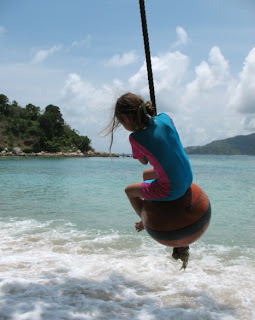 My daughter enjoyed swinging on a buoy which has been hung from a tree hanging over the sea. The kids enjoyed catching hermit crabs (they did set them free again). A nice (and sunny) day.